Behavioral teaching objectives belong to three domains which are cognitive, psychomotor and affective. Cognitive is where knowledge are attained. 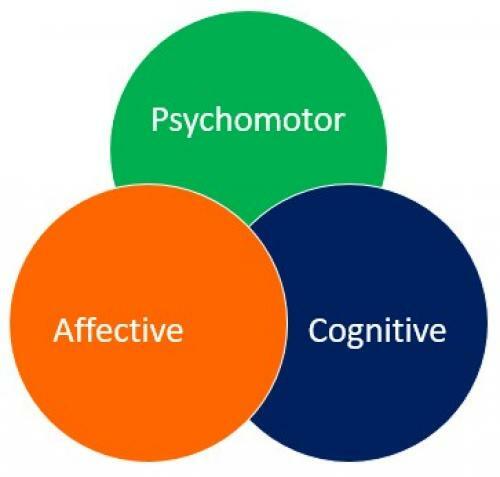 Psychomotor generates physical skills out of the knowledge while affective leads to attitude or values displayed by learners after knowledge acquisition. These three domains are targeted by the objectives in the learning processes. These can be further understood through the new version of Blooms taxonomy of objectives alongside lessons' illustrated examples and brief explanations out of language contexts. First, the cognitive domain has two level objectives which are the higher level objectives and the lower level objectives containing classified and sequenced specific action verbs that determine or show the intensity.These levels correspond to determine the order thinking skills namely: higher order thinking skills and the lower thinking skills. The higher order thinking skills which are applying, analyzing evaluating and creating cover the higher level objectives. While the lower thinking skills that comprise remembering and understanding match with the lower level objectives. While objectives are applied in the cognitive domain, both order thinking skills and level objectives portray similar roles. The following stated objectives combine the order thinking skills and higher level objectives determined by the verbs and the cognitive processes. a. Enumerate adjectives and nouns that you read from the travelogue. b. State adjectives and nouns that you have listed. The two stated objectives belong to remembering as the first lower order thinking skill. At the same time, the verbs, enumerate and state are covered under low level objectives. Remembering has a cognitive process known as recall of newly learned concept. c. Describe the nouns by using the adjectives obtained. d. Explain why the adjectives should come first before the nouns. Adjectives comes first before the nouns. Adjectives describe the nouns. The two stated objectives belong to another lower thinking skill which is understanding. Likewise, the verbs, describe and explain originate from lower level objectives. Understanding is a way of expressing comprehension to newly learned knowledge. e. Utilize adjectives and nouns to form sentences. The green mountains are so beautiful. It is a bright horizon. Many excited visitors came. The fresh water rivers have some vibrant stones. Colorful fruits hang around trees. f. Modify your sentences by adding prepositional phrases. The green mountains were so beautiful at daytime. It is a bright horizon in Guadalupe. Many excited visitors came to this place. The fresh water rivers have some vibrant stones on their beds. Colorful fruits hang around from many trees. These two objectives demonstrate applying as a higher order thinking skills at the same time a higher level objectives marked by the presence of the verbs, utilize and modify. Applying is the use of knowledge to generate an outcome. g. Examine your sentences if they are in the simple past or in the simple present tenses. h. Contrast past from present sentences. Past tells completed action in a particular time while present tells an ongoing action in a specific time. These two objectives demonstrate analyzing as another higher order thinking skills at the same time a higher level objectives due to the presence of the verbs, examine and contrast. Analyzing is a learners' ability to breakdown parts of concepts to be able to understand produced structures representing concepts. I. Revise your present tense statements into past and your past tense statement into present. j. Validate the tenses of your statements by identifying the verbs that make the tenses. These two objectives demonstrate evaluating as another higher order thinking skills at the same time anchored to higher level objectives made by the presence of the verbs, validate and revise. Evaluating is a learners' ability to decide or support judgment by sanctioned learned concepts. k. Formulate a title out of the read paragraph. l. Compose a paragraph using the sentences with present tenses that you have framed. The green mountains are so beautiful. It is a bright horizon in Guadalupe. Many excited visitors come to this place. The fresh water rivers have some vibrant stones on their beds. Colorful fruits hang around from many trees. There's a place that I want you to explore. Every year, many excited visitors come to Guadalupe. Its green mountains are so beautiful with bright shining horizons. Its cascading waterfalls find their ways to silent fresh water rivers with some vibrant stones on their beds. As you travel from one place to another, you see colorful fruits hanging around from many trees. These are what you can see in spring of this lovely paradise. The green mountains were so beautiful at daytime. It was a bright horizon in Guadalupe.Many excited visitors came to this place. The fresh water rivers had some vibrant stones on their beds.Colorful fruits hanged around from many trees. There was a place I've seen before which I want you to explore. Years ago, many excited visitors came to Guadalupe. Its green mountains were so beautiful at daytime with a bright shining horizon. Its cascading waterfalls found their ways to silent fresh water rivers with some vibrant stones on their beds. As I traveled from one place to another, I saw colorful fruits hanging around from many trees. These were the things I saw during my visit in spring of this lovely paradise. I hope things did not change these days. These four objectives demonstrate creating as the highest order thinking skills with the highest level objectives because of the presence of the verbs: formulate, compose, produce and create which are covered under higher level objectives. The students will have the ability to associate concept and theories learned and will able to create or generate a composition through the rules of grammar, transformation of words and assembly of ideas as well as integrating other focus to form the targeted output of the whole task. Creating is the integration of acquired information and concepts for the completion of the highest an intended outcome. You will note that as the activities progress, the levels of difficulty increase. The effects suggest that the level objectives and the order thinking skills correspond to each other in terms of developing the critical thinking of students. Secondly, the psycho motor domain comprises behavioral objectives that are expected to be demonstrated by learners. This domain is easily observed due to the physical actions performed by learners. Psycho-motor domain has levels that are embedded in teaching and these are naturalization, articulation, precision, manipulation, imitation. To clearly understand this domain, we connect formulated examples from the lessons covered under the cognitive domain. a. Prepare a schema that shows the classifications of nouns and adjectives and how they connect in word order. Compose an oral report of this diagram to be rendered in class. Use a projector during your report. The objectives which are prepare, compose, use or utilize are verbs that covers the psycho-motor domain of objectives. They support the domain's levels that are called, articulation and manipulation which involve physical activities. Preparing a schema is a writing activity similar to the composition of an oral report which requires physical activity and this bodily activities are reinforced by the manipulation of a projector during the reporting session. b. Deliver the composed paragraph aloud in front of the class with corresponding gestures to express your ideas. c. Simulate/ dramatize in front of the class. Be able to set up a microphone to amplify your voice during delivery. During this part, no one is allowed to ad lib. Use exactly the lines stated in the script. The script should be delivered in 3 minutes. Waleed: Its green mountains are so beautiful (He draws mountains on the air.) with bright horizon (He looks at the sky and raises his two hands forward.) at daytime. Khalid: It will be a great adventure if that is so! (He says it aloud obviously excited). Waleed: You won't believe this but as you travel from one place to another, you'll see colorful fruits hanging around from many trees. e. Identify and point at the pictures corresponding to the words uttered by the teacher. f. Draw the figure as the teacher says it. Affective domain is closely- related with motivation. The highly motivated the learners are, the more they move into the higher levels of this domain that is basically concern with the formation of feelings, values and beliefs. These five levels are receiving, responding, valuing, organization and characterization. Receiving means that learners simply have to listen and accept knowledge that are being taught. Accept or receive the importance of adjectives to nouns and observe the importance of both parts of speech in grammar. Accept, receive and observe fall under receiving as the first level of the affective domain. Responding is when learners are expected to obey, participate, or respond willingly when asked or instructed to perform. Follow the instructions to come up with a paragraph using the formulated statements and participate in identifying the adjectives in the given passage. Follow and participate are objectives found within the second level of this affective domain. Valuing display a high degree of valuing which are formed through compliance to what is dominantly sanctioned by a situation. Express views on the importance of associating with others as represented by the use of adjectives and nouns in the word order and help each other perform the task comparative to supporting each other in deciding the proper word to form appropriate word orders. Express and help are classified objectives under this domain which may bring the practice of collaboration to be valued..
Organization is applied when one is expected to decide choices into a value system and apply the opted ones. The learner individually weighs and considers the values dominantly displayed. Formulate the idea that each individual is relevant in different ways comparable to the idea that adjectives have different usages and select the words you use to communicate with others just as you choose the suitable words in the constructions of word orders. Formulate and select are specific verbs used under this fourth level of this domain. Characterization is forming values a part of one's philosophy of life. The values in them form parts of their social being. Values are embedded in the learners' human characters. Respect others dignity by choosing suitable words to address in comparison to how adjectives are used to nouns appropriately and display respect to human dignity through the words we say tantamount to errors committed when we used inappropriate word descriptions to nouns. The utilization of respect and display are some of the appropriate verbs used in formulating this highest level of affective component. All these domains must be incorporated to learning areas such as lesson plans, course outlines, delivery plans, syllabi, curricula as well as educational organizations' development, strategic and operational plans. Since the lesson plan is the basic instrument to relay directly learning in the classroom, we further understand the significant incorporation of these domains through an illustrated sample. In writing a lesson plan, there is no standard format to be followed. However, for uniformity of teachers working in a similar educational organization, there is always an institutionalized format. Plan formats may vary from one institution to another but they contain similar major components such as objectives, subject matter, procedure, discussion, evaluation, application among others parts they use in varied terminologies bearing common functions. Note that in the statement of objectives, we don't need to incorporate all the levels. Integrating all the levels of the domains is impossible. As an alternative, teachers prioritize objectives through the activities indicated by the lesson/s. Topic: word order between nouns and adjectives in grammar structures. The teacher shows a globe and ask the students to locate some countries. The teacher further asks where Guadalupe is for familiarity of its location, tells the students to read a brief article about Guadalupe, and flashes the article on the board through a projector. There was a place I've seen before that I want you to explore.Years ago, we visitors were so excited to see Guadalupe. Its green mountains were so beautiful with bright horizon at daytime. Its cascading waterfalls found their ways to silent fresh water rivers with abundant vibrant stones on their beds. As I traveled from one place to another, I saw colorful fruits hanging around from many trees. These were the wonderful things I saw during my visit in the spring of this lovely paradise. I hope it is the same to these days. c.1 Unlocking of vocabulary difficulties. Teacher monitors the words to explain the vocabularies by pictures and contexts. c.2 Reading and repeating of the words emphasizing on R and S sounds are significant since they will be uttering these words most often during discussion. Assign few individuals, by rows and the whole class. c.3 Comprehension questions will be used in order to feed in the ideas as they occur in the text. 1. What's the name of this place? 2. What kind of mountains did Guadalupe have? 3. What was beautiful as told in the passage? 4. What kind of horizon did this place have? 5. Which one was bright? 6. Where did the water falls flow? 7. What were found underneath the river? 8. What kind of stones was stated? 9. What we're hanging around from many trees? 10. When did the speaker see this place? 11. What was his one-word description to this place? 12. Why did many people visit Guadalupe? c.4 The teacher asks the students to list nouns and adjectives that they see in the passage. c.5 The teacher monitors the responses labeling the first column as nouns and adjectives in the second column. Students are tasked to write whatever word they think belonging to any of the columns. At this point no answer is wrong. adjective+ noun. From here the teacher further asks which one is the noun and which one is the adjective. Students are tasked to arrange the words according to the given equation. Out of these illustrations, students will form an idea about how the two classes of words are linguistically arranged. d.2 The teacher draws their attention to what they have on the lists and question what column should come first if they are to follow the word order equation. Again, as an emphasis, the students are requested to examine why should these adjectives come first. Agreement on the order of adjectives and nouns will be established. d.5 Each one called goes in front to choose adjective and noun to be paired appropriately. d.6 The teacher ask question based from what they have written to elicit nouns or adjectives as responses. How do you describe the waterfalls? What are cascading? Tell something about the waterfalls. These types of questions explain the word order between noun and adjectives. e.1 There are words in this series that are not appropriate to describe a caring mother. Mark the words with X if they aren't. e.2 There are words in the statements that are not in their proper order. Correct the order. Monarch Butterflies dead are found in far Islamabad forests./ Flowers spring are coming out./That time, it was a night dark. /The children young came to the party birthday./ It was a night chilling when the storm strong came./ The excited children jumped out of joy. e.3 Identify the underlined words if they are used as adjectives or nouns. Unknown names were written on old walls of a damaged building./The innocent boy in striped pajamas was counted in by mistake among the pitiful prisoners in a concentration camp during the bloody conflict in historic Poland. All answers will be processed by the teacher to be able to create a general knowledge of the word order existing between nouns and adjectives. If I am going to sequence the words, examination and difficult in a phrase or in a sentence, which word should come first? Why? Is it right when I say smart ELI students, exciting vacation, technical courses, Pakistani persimmons, splendid Lahore, wondrous Islamabad's spring, Guatemalan forest..? Match the appropriate adjectives for the nouns. Choose five correct pairs of words and construct sentences out of them. The utilization of the three domains of objectives which are cognitive, psycho-motor and affective reflect the significance of intended outcomes which are the real foundations of the rudiments of teaching. Every lesson that we conduct should incorporate these three components to be able to gauge learners' capabilities towards what we teach. They serve as students' performance indicators to which we base our procedures to develop further strategies that may cater to slow or fast learners. Integrating the fundamentals of the domains of objectives is indicative of students' acquisition of knowledge for intellectual capabilities, cultivation of physical abilities through acquired knowledge and formation of values from learned principles.